Three reflections here. One, the seahorse looks kind of emaciated and weak. Therefore, only low-mass stars can form inside it. Two, the Seahorse is very elongated (and twisted). Very many starforming molecular clouds in the Milky Way are very elongated. Perhaps they have become elongated due to magnetic forces? Three, there are elongated molecular clouds that are much heftier than the Seahorse, and which therefore give birth to much more massive stars. 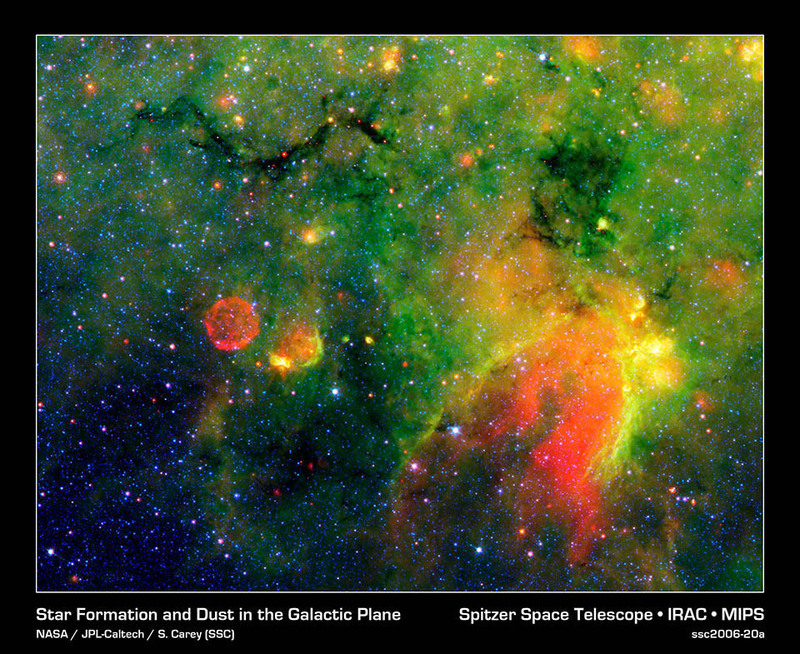 At left you can see a Spitzer Space Telescope image of a cosmic "snake", seen at top left in the picture, which is forming truly massive stars. One of the huge baby stars being born is seen close to the middle of the "snake" as a glaring red eye. Good point, that elongated shapes are common among star-forming regions. I have read that such things as the seahorse and the snake have been hypothesized to have arisen from the shock waves from nearby supernovae. Whether magnetism could also be an influencing or contributing factor sounds interesting. What would be the source of it? I guess the galactic plane itself has a field. <<A dark nebula or absorption nebula is a type of interstellar cloud that is so dense that it obscures the light from objects behind it. These clouds are the spawning grounds of stars and planets. The extinction of the light is caused by interstellar dust grains located in the coldest, densest parts of larger molecular clouds. Clusters and large complexes of dark nebulae are associated with Giant Molecular Clouds. Isolated small dark nebulae are called Bok globules. The form of such dark clouds is very irregular: they have no clearly defined outer boundaries and sometimes take on convoluted serpentine shapes. The largest dark nebulae are visible to the naked eye, appearing as dark patches against the brighter background of the Milky Way like the Coalsack Nebula and the Great Rift.